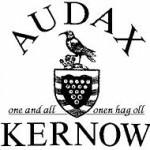 The Audax UK season runs from 1st October to the end of September, so the local 2015 season started with Ed’s Mince Pie and Mulled Wine ride in December 2014, and the last few months of 2015 fall in the 2016 season. If you completed an event within the time limits and with a valid Brevet you will be included in the number of riders finished and you will usually appear on the full AUK results list for the event. You can order cloth badges and metal medals for the standard distances, and Grimpeur medals for AAA points, online from the Audax UK website. Ed’s ride proved as popular as ever, as the rain of early morning cleared away before the start, and riders set off hot foot towards the magnet of the Penventon Farm control. 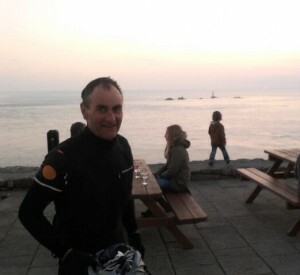 A warm welcome and a groaning table of pasties, sausage rolls, scones and a variety of cakes greeted us and tempted us to stay, but eventually that long haul back up to Black Rock must be faced and even enjoyed. Back at the arrivée mince pies were warming and Thora had worked her magic on the cauldron of mulled wine. Most made it back without even catching a shower. Many thanks from all the riders to Eddie, Wendy and all the helpers for a great start to the festive season.